Originally designed for owners Samuel and Adele Marcus, the building is historically important because it was Cody’s first independent commission in Palm Springs, and launched his solo career in the desert. The 17-room modernist hotel is located at 225 West Baristo Road close to the downtown in the historic Tennis Club neighborhood. The hotel immediately became a popular destination and remains so to this day. Said to have been inspired by Frank Lloyd Wright’s Arizona architecture, the project won a creative design award for the architect from the Southern California chapter of the AIA as an example of cutting-edge resort hotel architecture. Built of native stone and redwood, surrounding a shimmering pool, architectural features include luxurious suites, an “organic” asymmetrical entrance doorway, and floor-to-ceiling glass. The two-story building (with a single-story shed roof section on the northeast corner) features a U-shaped plan centered on a courtyard, a design which encourages socializing among guests. 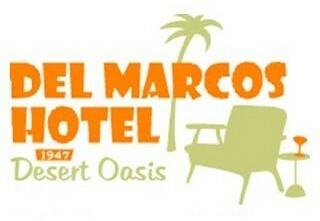 A Class 1 historic site designation of the Del Marcos Hotel was made official by a Palm Springs city council resolution on May 2, 2012.